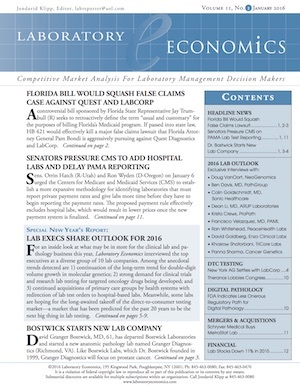 You can order Laboratory Economics for the yearly subscription rate of $395 for one year. Subscription includes 12 monthly issues sent both electronically and by regular mail plus access to all back issues in our archive. Hear success stories about smaller labs and start-ups that are challenging the large commercial labs–often succeeding where bigger labs fail. Our editors talk directly to the people making the news, providing you with a first-hand view on lab marketplace developments. Every issue of Laboratory Economics is packed with hard data, clear analysis and valuable business strategies that will help your lab become more successful. If you decide at any time during your subscription–for any reason whatsoever– that you no longer wish to receive Laboratory Economics, simply notify us and we will cancel your subscription immediately. The unused portion of your subscription will be promptly refunded. No further obligation…No questions asked.